Two things last week sent me thinking about the paralysis affecting the English political system, passed down from a paralysis embedded in society south of the Border and within both main political parties. 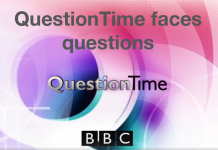 First was Question Time from Derby. It was a rare viewing choice, partly because I wanted to see how Fiona Bruce was changing the programme and partly to see reaction from an industrial, come post industrial town in England’s heartland. The second was watching Fintan O’Toole’s lecture at Queen’s University Belfast. This award winning journalist is always worth reading and indeed listening to. The Irish have a unique take on England’s position in the world having seen how a once mighty empire has crashed and turned in on itself with a lack of introspection mired by confusion over identity. Ireland has that distance, whilst also remaining in close contact through interrelation with the nations of their larger neighbouring island and the outpost of post colonialism in the North. Fintan O’Toole understands the political and societal divide of the nations, currently comprising The United Kingdom of Great Britain and Northern Ireland. It is also something Scotland understands given our overwhelming wish to remain European. Yet at the same time we do not have the distance the Irish enjoy because we are not an independent country and for many the conflicts of present interconnections across the Border leave some in confusion and uncertainty. In Friday’s FT Tim Harford explored why people find it so hard to change direction, whether for an action or a firmly held opinion. Expediency can force decision making down a path that excludes proper recognition of problematic information. He compares the wrecking of the Torrey Canyon in 1967 as a prime example. The tanker was off course, the First Officer adjusted direction. The captain countermanded because that would delay delivery and timeous delivery was his key objective. He gambled that he could steer the tanker between the Scilly Isles and the English coast. By the time disaster was inevitable there were no alternatives left. It is a clever analogy and linked with my take on the Derby Question Time. 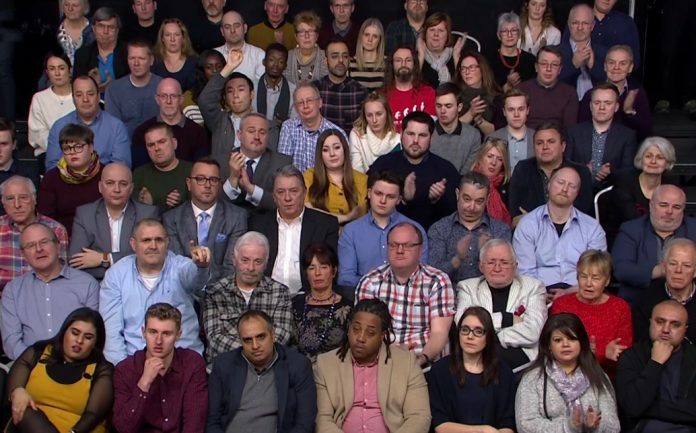 The proBrexit audience members dominated the front rows, primed for thunderous hand-clapping at anything confirming their hard Brexit view. Their very insecurity demanded any validation for Brexit, assuring themselves they had made the right choice. We can all be guilty of confirmation bias but there was something larger going on in Derby, and indeed there is across England as exit from Europe hurtles ever closer. The search for England and what Englishness means in a post European world is expressed in anger, torment, anguish a ‘something’ they must have regardless of the consequences. Fintan O’Toole is incisive as ever in his Queen’s University lecture on the emergence of English nationalism today, more dangerous than that propagated by the ruling classes of post empire and WW2 relative prosperity. They will suffer for their cause and deny humiliation erupts from a search for an unattainable future. The influence of a wealthy, public schoolboy Brexit coterie will be a cost too high and realised too late. Over in N Ireland the DUP zealots talk about ‘blood red lines’ over the border issue. That must really worry majority opinion in the province. But there is more to England and the audience in Derby. Close examination of Thursday’s programme audience shows many sitting quietly, arms crossed as the Leave contingent howled and clumped. Remain questions were softly articulated as they reacted in self defence to the prevailing audience mood. Most Remainers and opponents of No Deal were in the back seats. Like the Torrey Canyon, Brexit is heading for the rocks, out of time, out of solutions, out of viable alternatives, out of political direction. Mrs May’s unchanged Plan A is back for another thrashing in the lobbies come 29th January. May, Corbyn and Westminster are making the case for Scottish independence. We have known for months, in fact years, the Tory party is a coalition of irreconcilables beyond the internal coalition normal in party politics. It has to break but nobody is willing to make that break and move to a more centralist position as that will destroy May and anyone else of that ilk because the rank and file out in the country are with the Rees Mogg’s moderately named European Research Group (ERG) but in reality Brexit zealots for a cause that will finish any pretence the UK is a global influencer. Mrs May opened her door for conversations, listening with a closed mind. Now No10’s door is closed again. The SNP and others have told her the only way forward is to take No Deal off the table. She will not do so because the ERG contingent will walk out along with the DUP. As a political party the DUP has no counterpart anywhere else in these islands. They are voting fodder when the need arises, simply convenient allies for May’s Brexiteers and working class leavers searching for an English past. The colusion is a convenient alliance for wealthy public schoolboy Brexit conservatives whose real concern is the retention and growth of their wealth. The merging of Northern Irish ‘Britishness’ with the search for working class ‘Englishness’ rising out of an imagined past, is a useful divergence to trap these unsuspecting conscripts in the poverty they hoped to escape from. Labour are in an equally conflicted place with Corbyn scared to back off from his marginally softer version of Brexit because Labour’s target seats are in Leave constituencies. Shadow ministers from Leave supporting constituencies are threatening to resign – a mirror image of May’s government over many months. The only way Labour can move is if they break Corbyn first. Like May he stays because the time required to move him is not available. Meanwhile party members and voters are heading for the exit. The result is the two main parties are paralysed, daring the other to blink first. No wonder poor old Blighty is an international laughing stock. There are no deals to be gained outside the EU. Fresh from the fiasco of the last two years the UK would be at the mercy of other countries without the market the EU can offer when negotiating treaties with other major economies. Scotland can draw a sigh of relief that the SNP as the governing party is united. Committed to find a way through the debris of the English political fallout. Scotland is no Torrey Canyon. The ship is on course and the crew well co-ordinated. We have continued to campaign for independence and our place in Europe since the failure of 2014 and the EU referendum in 2016. Unionism has never been so conflicted and so divided but retains an ability to play on marginal differences. That is the history of Empire. We must continue to talk to the electorate in Scotland. The case for the union is heading uncontrollably towards the rocks. As every day passes, May, Corbyn and Westminster they are making the case for Scottish independence. Identifying and getting out the vote is the task we must tackle given the likelihood of a general election soon. Every success builds support for the next independence referendum – coming soon.